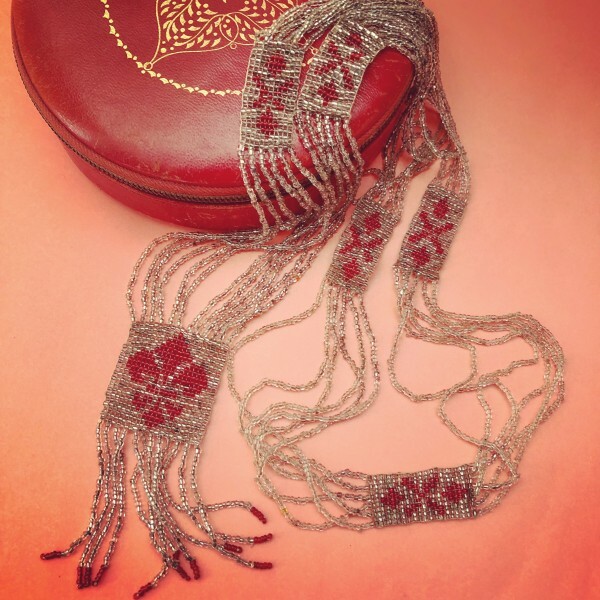 This beautiful example of a 1920s tasseled flapper necklace is in wonderful condition. This silver and red glass microbead necklace features intricate beadwork panels, with the central panel detailed with a Fleur de Lis. Each panel is linked together by 12 strands of beads and suspended from the central panel are 12 beaded tassels. The necklace measures 90cm. The drop of the central panel is 8.5cm and its width is 3.5cm. Glass has been a prevelant feature of costume pieces since the invention of jewellery. An easily accessible material that can be formed into any shape and dyed any colour. Glass was heavily used in Art Deco pieces, such as this necklace, because it could be dyed in a vast array of colours to meet the need for affordable jewellery after the Great Depression and First World War. This necklace would look sensational with a midi length tea dress and leather jacket.